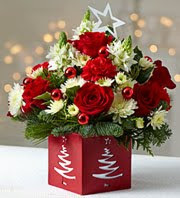 Global Influence has teamed up with 1-800-FLOWERS this holiday season to promote 1-800-FlOWER's Toys for Tots program. 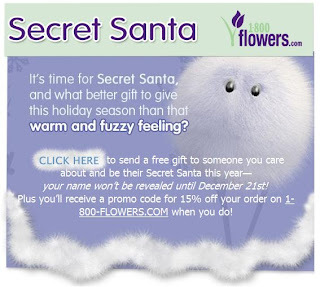 Just go to 1-800-FLOWERS' Facebook page HERE, become a fan and try out the Secret Santa program to send a warm and fuzzy greeting to someone. It's an exciting way to send a gift of warm and fuzzies without them knowing who their Santa is and it's FREE! Your name will be revealed but not until December 21! Here is where you come in, if 10,000 Warm and fuzzies are sent by 12/21, 1-800-FLOWERS will donate $5000 to Toys for Tots. What a great way to help a wonderful holiday tradition for supporting needy children while sending surprise greetings to someone you love! It costs nothing and will produce endless smiles. 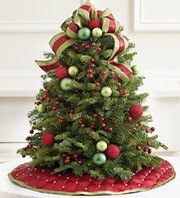 It's free so hurry and you get a 15% off coupon to purchase your own warm and fuzzy like this beautiful tree that is calling my name! This arrangement is another one that I'm really wanting to get this year for my table. There are so many choices to choose from. 1-800-FLOWERS is also going to help spread holiday cheer to less fortunate children with their new Toys for Tots Collection of holiday flowers and gifts. Get your warm and fuzzies going and head on over to send your Secret Santa wishes and help Toys of Tots thanks to 1-800-FLOWERS. Disclaimer: For this post, I entered a contest for an arrangement which I won. The arrangement post can be viewed here.